Despite working for three different companies, Akari, Aika, and Alice always train together. Only belatedly do they worry that this might be unconventional enough to annoy their mentors. It is at first a relief when they find out that their mentors (Alicia, Athena, and Akira) also practiced together when they were journeymen. Alicia’s story about old days with her friends is heart-warming, but it has a melancholy moral: one day circumstances will push Akari, Aika, and Alice apart. Everyone is shivering at the beginning of this story. Does Aria not have central heating? Everything is temporary. Enjoy what you cherish while you can. Akatsuki’s brother hires Akari to transport a precious cargo of Neo-Venezian glass. The glass blower’s apprentice who accompanies the pieces is oddly sullen. Akari wants to know why, which leads to a discussion of the authenticity of a revived lost art. Akari, who lives in a recreation of a lost Italian city, has opinions on the matter. The original Venice is very definitely gone. The humble glass blower is lucky his Undine is the eternally cheerful Akari and not dour Aika, who probably would have simply yelled something like “Unhappy customers are prohibited!” at him. Neo-Venezia has preserved Venice’s habit of sequestering skilled workers. Venice apparently forced all of its glass-makers to live on a particular island. Neo-Venezia does something similar with Salamanders and Gnomes. Akari dreams of being like Alicia … but what did Alicia want to be when she was young? It’s winter; they’re making snowmen and nobody is wearing mittens. Do they not have mittens on Aqua? Because that would be consistent with them also not having central heating. That would be reasonable in the original Venice but Neo-Venezia is on Mars. Perhaps they want to rethink their approach on this. Alice rescues an abandoned kitten and hides it in her room at the hostel. Which is strictly forbidden. No pets. Eventually, someone will notice the kitten and then what? We never learn who dumped the kitten on the docks. Or if anyone did. It does not act as if it were lost or abandoned. Mind you, neither did my cat Ibid when he came strolling up, looking for food. Haunted by the sounds of a train in the night, Akari dreams of riding the famed Galaxy Express. The train she finds herself on is something weirder: the magical train of cats. The translation I read was marred by a homophobic slur in the footnotes. Bah. Not only do the Neo-Venezians not have central heating or mittens, they use a single light blanket on the bed in midwinter. Hrm. Is the author not familiar with cold? We Canadians certainly are. Well, not the people on the Pacific coast. And the people up in NWT, Yukon and Nunavut are probably amused at my claim to understand cold. 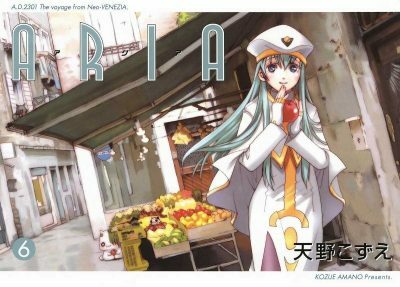 President Aria finds his way into an unfamiliar gender-flipped parallel world. I would never have compared President Aria to the Ice King…. Everything is temporary but as we see, themes repeat. The names of the trio of close friends changes from generation to generation but the essential relationships persist. Aria, book 6, is available here.